Forms and surveys are complicated. Sure, they look simple—how hard could it really be to arrange questions and bullet points on a page? Try to choose from the dozens of field options and settings in your form app, though, and your simple contact form just got a lot more complicated. At Zapier, some of our most popular integrations are with form apps—and we’ve spent the past few months researching the best tools to build forms and surveys, and the tips you need to get the most out of them. Here are a few pointers to help your next form be great. You need to collect data—perhaps contact info, or your users’ thoughts about your app—but what type of form do you need? Polls, surveys, and plain-old forms are all similar, after all. Each collect data, but with a different goal in mind. Polls are the simplest. They’re one question you’ll ask, perhaps on the bottom of your marketing emails or in a your site’s sidebar, to see what people think about something. Quick and simple. Surveys are long polls. List a ton of questions, and get back answers. 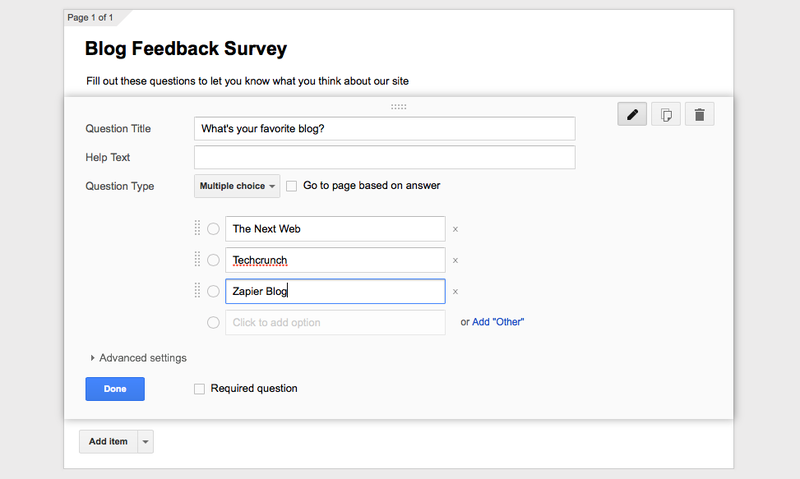 A census is a survey, as are lists of questions you’d ask to get feedback about your product. Forms are even broader—they can be anything you want. You could make a poll or a survey with a form app, or you could make a contact form, an order form, a startup, or just about anything else. If you have one question, use a poll app. More than one question? Use a survey builder. Then, for your most complicated data collection needs, use a form app. You only need one app to build your forms—and perhaps another for your surveys. There’s dozens of form and survey builders available, each with their own advantages and special features. But they’re all quite similar—really. We rounded up dozens of form apps and survey builders, and it’s still hard to pick the best app. If you’ve already used a form app—Wufoo, Typeform, Polldaddy, SurveyMonkey, or any others—then your best option is to just keep using it. Dig into its features, make a nice template, then just use it to make your forms. It’s already pretty great. Or, if you need a new form builder, it’s hard to argue with Google Forms. It’s free, built into Google Drive, and automatically saves your form entries to a spreadsheet. That’s a great place to start building quick forms. Want clear answers? A better form app won’t help. You’ll instead need to spend more time writing better questions instead. Before you build your form or survey, think about the answers you want to get. Then, write your questions specifically to get those answers. Edit out any extraneous words to make your questions as clear as possible, then think about the type of form field that answer needs. Do that first, and building your real form will be a simple task. 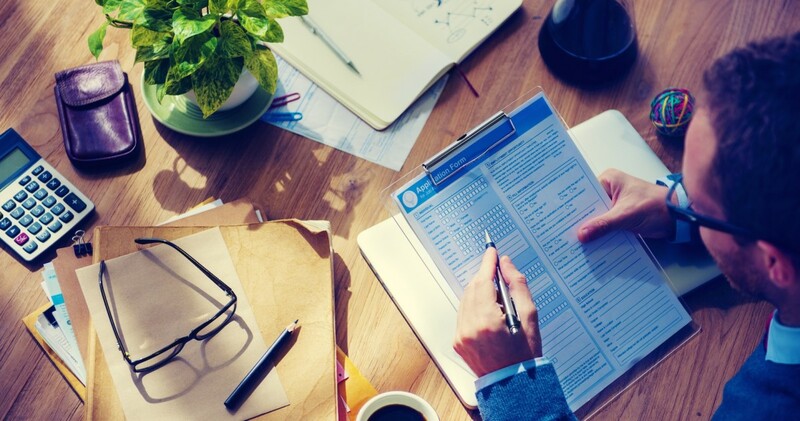 Form and survey builders are packed with powerful features, but one of the best and most easily overlooked is field validation. Field Validation tells your form app what type of data the answer should contain—a phone number, email address, website, or just plain text—and the form app will make sure the answer includes a valid entry. It’ll take a couple extra clicks to activate field validation in your form app, but will make sure the data you collect is actually the data you need. Graphs are eye-catching, perfect for boardroom PowerPoints and business news. But they’re not always the best way to present and analyze the data you collect. With most forms, it’s best to list your data in a table or spreadsheet. Tables are ideal for precise answers, when there’s little you can compare between any two responses. When you have a lot of data to compare, though, a graph can be the best option. Good graphs distill the most important info, showcasing the highlights—or downsides—in ways a table never could. Just be careful: make the table show what the data says, not the other way around. Have a great new app idea? A form plus some automation might be all you need to build it. That’s how the Crew team built the early version of their startup to help connect developers and designers—they built Wufoo forms, connected them to MailChimp, Stripe, Google Spreadsheets and more using app integrations tool Zapier. “As far as I know, no one ever commented on the fact that we were using a Wufoo form,” said Crew co-founder Luke Chesser. Meanwhile, their form-powered startup was a success, pulling in over $25,000 in payments in three months. All that, with just a form. They’re far from the only business powered by forms. We’ve talked to travel guides, breweries, app developers, and more who use forms as a crucial part of their workflow. Experiment, and you just might build the next great app using a form. These tips were distilled from Zapier’s new free eBook. Before you need to build your next form or survey, be sure to read it online or download a free copy. With tips on picking the perfect form app, the best hidden features in form builders, ways to automate your forms and surveys, and tips on analyzing your data in tables and graphs, it’s a handy book to keep around for the next time you need to collect data.